Click here to view our featured news, events and special offers. Privacy, Security and Efficiency, that's what we're all about. We help protect your privacy by securing your mail with our Private Mailbox Service. To read more about our company, click here. It has been brought to our attention that a mailbox service company recently discontinue private mailbox services abruptly. For customers who quickly need an alternative private mailbox solution we are offering 4 FREE MONTHS. Requires proof that you had a mailbox at the company discontinue private mailbox services. We offer a secure and convenient mailbox service as well as Mail Forwarding, Mail Tracking, Phone-in Mail check, among others. Check out our rates and select the services that best fits your needs and budget. Recent news that might interest you. Get rewarded for choosing to secure your mail. Check out our latest promos and available coupons for our services. What is a private mailbox and how is it different from a P.O. box? Find the answer to this and other frequently asked questions here. WHAT'S NEW - click on arrows to view our new news. 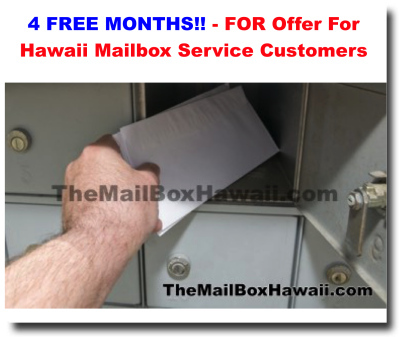 SPECIAL OFFER FOR HAWAII MAILBOX SERVICE CUSTOMERS! GET ONLINE DISCOUNT! Click here. For customers who quickly need an alternative private mailbox solution we are offering 4 FREE MONTHS. Requires proof that you had a mailbox at the company that discontinue private mailbox services. 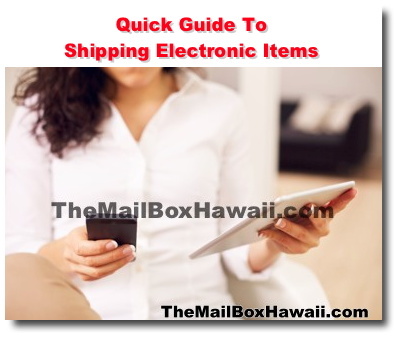 If you have a friend or loved one serving overseas either as a military service member or diplomatic staff, nothing would make their day more than receiving mail or packages from home. 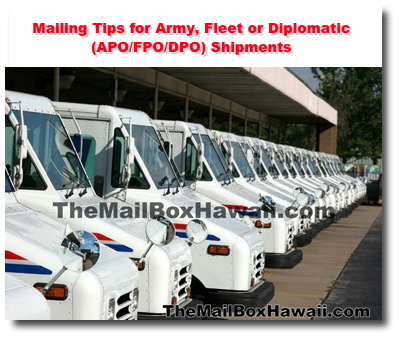 To help get your mail there, here are some helpful tips and guidelines for Air/Army Post Office, Fleet Post Office or Diplomatic Post Office (APO/FPO/DPO) shipments. 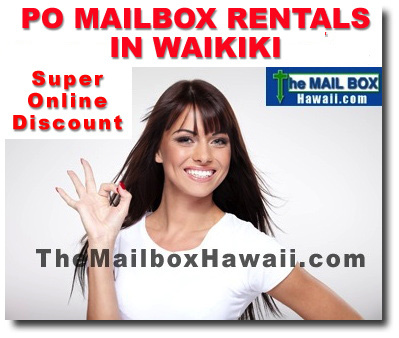 College students with valid campus ID will get a special discount for their po mailbox rental. 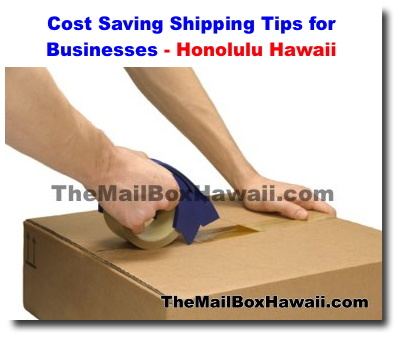 With the rising costs of shipping, here are some tips to help businesses not only save some money but also effectively get their products out to their customers. If you're always traveling or on the move, private mailboxes are a great idea. This allows you to maintain a consistent long-term address. 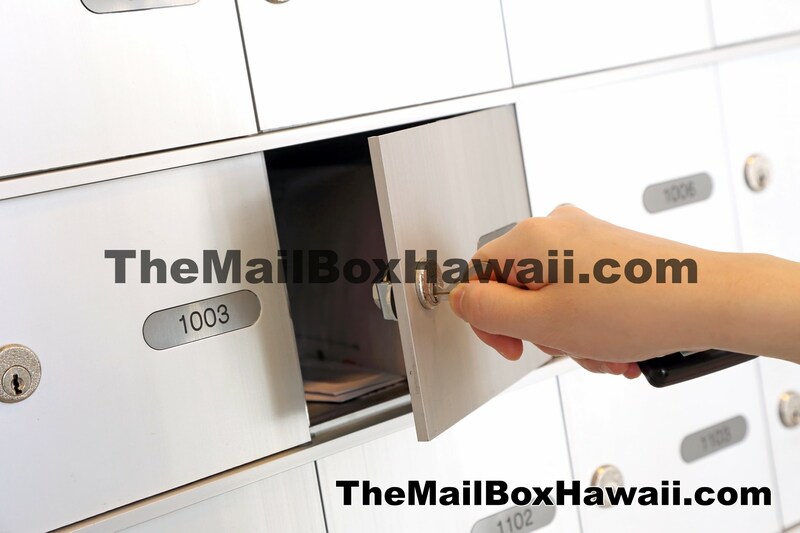 Mail forwarding is often a service that's offered by private mailbox companies like The Mail Box - Postal Service of Hawaii, so you can have your mail forwarded to a specified destination. If you're running a small business from home, renting a private mailbox gives you a more professional image than a conventional P.O. Box number. To prevent your packages from being left at the door which can be easily stolen or damaged in bad weather, private mailboxes can hold on to your packages for you. Unlike a P.O. 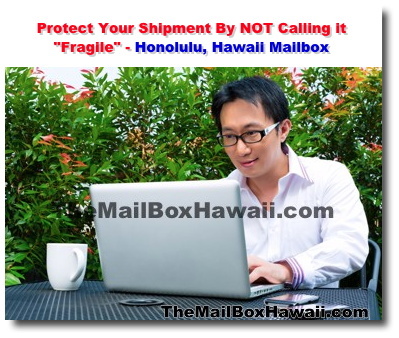 Box, UPS and FedEx can to deliver to private mailboxes like The Mail Box - Postal Service of Hawaii. Plus, you can sign up for our daily alert system via Twitter and text message that informs you that your mail and packages are available for pickup. A private mailbox protects you from identity theft. Most street-side mailboxes don't have a lock so your personal information can be easily stolen. 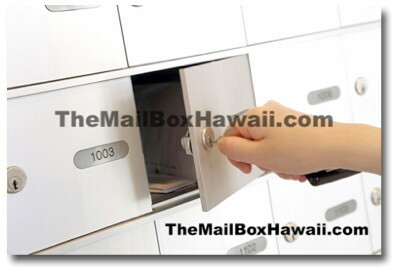 Mailbox postal services in the Honolulu, Ala Moana, Waikiki, McCully Hawaii Area. 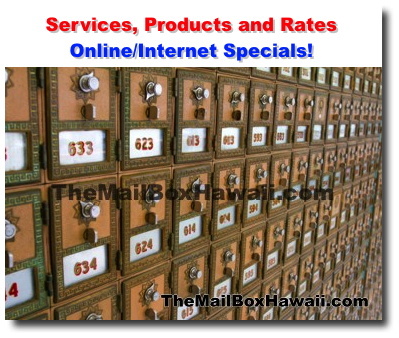 Operating since 1980, The Mail Box / Postal Service of Hawaii is all about Security, Privacy and Efficiency. We are centrally located in the same landmark building, "Century Center" at 1750 Kalakaua Avenue, Suite 201. Worried about the status of your mail? We can help by providing real time updates and location of your mail. Signup for our daily alert system via Twitter and text message for you to pickup your mail. The U.S. Postal Service Office of Inspector General recently conducted a national survey on the relative value of the different services provided by the USPS. This survey was done in partnership with Gallup and with Professor Michael Bradley of George Washington University's Department of Economics. 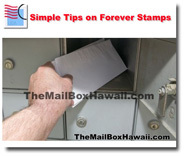 The United States Postal Service website is a great resource to purchase forever stamps. 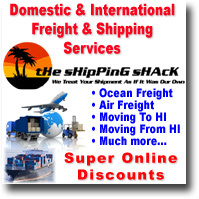 Your one stop resource for all of your shipping needs. Whether freight, motorcycles, vehicles, machinery, vehicles, artwork, etc. You name it we can do it at discounted rates! 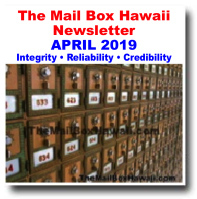 Copyright© 2011 - 2019 TheMailBoxHawaii.com. All rights reserved.